This is the beginning of a couple of Tiberian sun Infantry shp tutorials that i will be writing on my spare time. 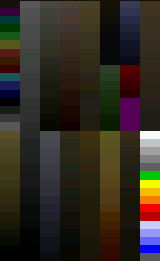 And the first thing that you need to know about when editing TS infantry shps is the colour palette. Tiberian sun Infantry shps, along with buildings and voxels, uses the unittem and unitsno palettes. 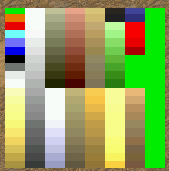 The unittem palette is the palette used on temperat maps and the unitsno is the palette used on snow maps. These palletes are almost identical. 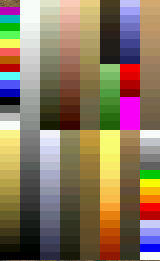 Below is an example of each palette. The top left black colour is the background colour and it wont be shown in-game. The colour below it is the shadow colour and it will be shown as fading black behind the infantry, dont paint this on the frames that the infantry is on, but paint it on the blank frames after the infantrys frames. The red colours in the bottom left are the remap colours. They change to the team colour ingame. The grey colours to the right of the remap colours are the greyscale colours. Use these to paint on the infantry if you want to make him grey. All other greys can be used for lightning the infantry up when he shoots. 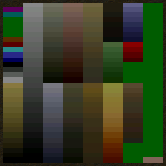 The brick colours at the top right of the greyscale are used for painting human skin. 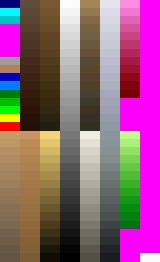 The four red's to the right of the green colours are non-remappable red's. They can be used for blood etc. The red's and yellows at the bottom right can be used to create normal fire effects when an infantry fires his gun. 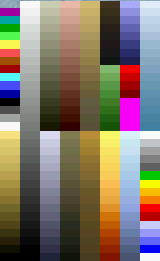 I think that ive gone through the most important colours of the palette now. If you think that i missed something then please say so in a replie. some more infos about the palette. You have the same result for SHP units without a turret like the wolverine. 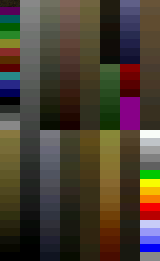 Now the palette for SHP units with a turret. as you can see it cuts the image and only a 160x160 pixel big part is shown. All turreted SHPs get cut off at this size, so make sure the canvas of the SHP is this size or smaller. You can see that some of the colors (the theater and glowing ones) are green. Those should be avoided when creating shp units with turrets. this is again like infantry or SHP-units without a turret. Snow map not done but obviously the same like infantry on a snow map. The final result is, that only SHP units with turrets make problems and use the palette in a different way. These are also the only units that can't be bigger than 160x160 pixel. Infantry, Vehicle SHPs without a turret and buildings don't make/have these problems. The Voxel Palette also has some restrictions. I just discovered exactly why many colors turn green for turreted SHP units. 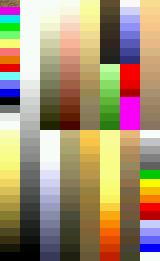 This is because any color that exists more than once on the temperat.pal palette, will be duplicated on the unittem.pal/unitsno.pal palette as well. 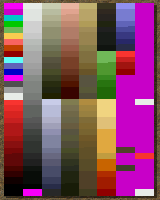 As you can see, exactly the colors that are pink on the temperat.pal palette turn green for turreted SHP units. So to solve this problem, you just have to replace all pink colors with other unique colors.